Tobico Marsh is a 1,848-acre a wildlife refuge that lies within Bay City State Park and almost within sight of the city itself. The area is steeped in history with Native Americans remaining until 1837 and the Tobico Hunt Club calling it home as early as 1907. 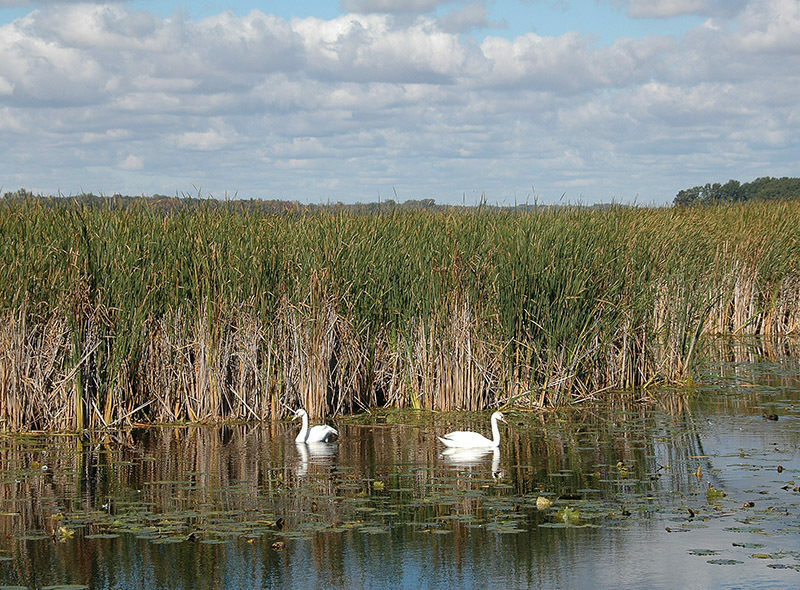 Tobico Marsh State Game Area itself is undeveloped and contains a variety of habitat, from small pockets of cattail marshes and oak/maple climax forest to Tobico Lagoon, a 900-acre body of water and the largest remaining wetland along Saginaw Bay. The entire area is home to deer, beaver, muskrat, and mink, but it's the wide variety of birds, especially waterfowl, that makes this refuge so spectacular. The lagoon’s large size, it’s the largest inland lake in Bay County, and the variety of aquatic plants found there combine to make Tobico one of the finest places to witness the fall migration in the Great Lakes region. Biologists estimate that in October there are usually 3,000 to 5,000 birds in the marsh and during peak migration from the third week of October to early November more than 25,000 have been known to gather at one time. 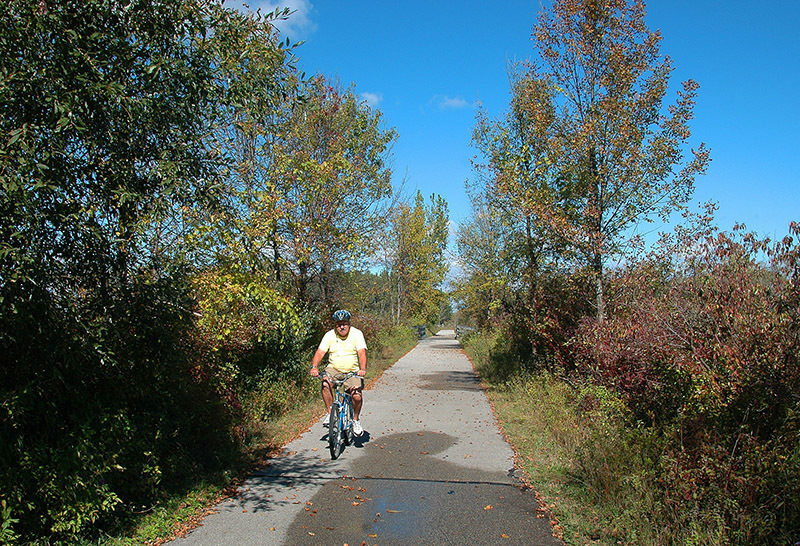 Winding through the refuge is an easy 2.7-mile loop that is linked to the park's Saginaw Bay Visitor Center by the Frank N. Andersen Nature Trail, a paved rail-trail. All three make for a pleasant hike or easy mountain biking outing of 4.8 miles. There is a trailhead to Tobico Marsh but by beginning with a visit to the park’s fine interpretive center you’ll gain an appreciation for the history of the marsh and once you’re in the marsh will be able to identify what’s winging overhead. Parking restrooms and drinking water is available at the Saginaw Bay Visitor Center inside Bay City State Park. 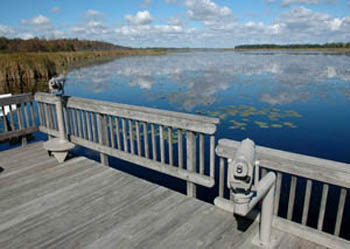 Originally one of the state’s oldest interpretive centers, the Saginaw Bay Visitor Center extensively renovated in 1996 into a 10,000-square foot facility that features displays on the history and ecology of the marsh, a life-size diorama of a duck hunter and his layout boat and an audio-video theater. But the most important exhibits for anybody venturing into Tobico are those devoted to identifying wildlife. They include a collection mounted birds, a photographic birdlist for the area and a hands-on exhibit that teaches you to recognize waterfowl by their calls. Outside the visitor center, marked along Euclid Road is the start of the Frank N. Andersen Nature Trail, a 1.25-mile point-to-point paved path. This outing begins by following the first half mile of the rail-trail, crossing Killarney Beach Road at Mile 0.5 and passing a handful of interpretive plaques along the way and two wildlife observation blinds along the way. Just beyond Killarney Beach Road, the trail splits and the heart of Tobico Marsh is reached by heading west (left) on a paved path that is a bit rough in places. This spur skirts the lagoon for a third of a mile and passes two more observation decks, the first being the best one in the park. The huge deck features benches two spotting scopes and large plagues that help you identify what’s dabbling in the open water in front of you. This is where you search for wildlife at Tobico. Beavers and muskrats skim its surface on the way to their lodges. Mink and otter have been seen early in the morning hunting along the edge. And in October thousands of birds arrive with puddle ducks; mallards, pintails, green-winged teals and widgeons, passing through early in the month followed by diving ducks, mergansers and geese later on. In a major staging area like Tobico ducks and geese will rest and feed for a few days before moving on, the reason the numbers fluctuate almost daily. Serious birders will pack along their own high-powered binoculars as the majority of the birds will often be in the middle of the lagoon. At Mile 1, the asphalt ends and you arrive the first of Tobico’s two observation towers. Both towers rise 40 feet into the hardwood trees and recently were renovated in 2012 thanks to the Friends of Bay City State Recreation Area. A wide dirt path continues west into the woods from the tower to quickly reach a junction with the Tobico Marsh Big Loop Trail. 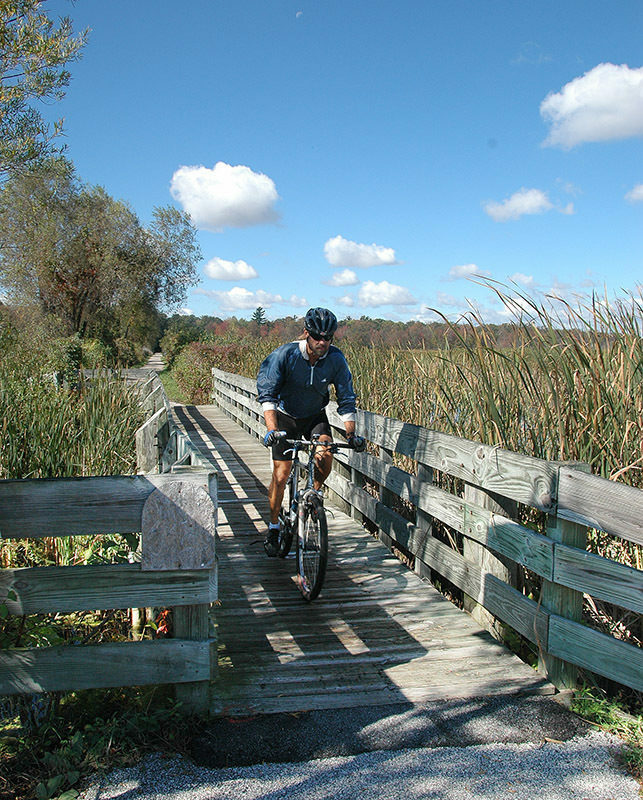 This 2.7-mile loop winds through the wooded interior of Tobico Marsh and is a level and easy ride on a mountain bike and a stunning hike in the fall as you begin by passing through a brilliant canopy of white and red oaks, maples and poplars. At Mile 1.75 you arrive at a second tower while nearby is a 300-foot boardwalk that leads you through into an amazing thicket of cattails but little or no view of the open water of the marsh. This was the site of the Tobico Hunt Club, which, according to the extant records, never had more than eight members during its existence from 1907 to 1956. The exclusive club was never lacking, however, for it featured cottages with porches and fireplaces, boathouses, blinds scattered throughout the marsh, and a caretaker who lived here year-round with his wife and children. It was Frank N. Andersen, one of only two surviving members of the club, that offered the marsh to the state as a wildlife refuge in 1956. Just past Mile 2 you begin the backside of the loop, a mostly level trail that winds through the woods and crosses a pair of small wooden bridges. Keep an eye out here for whitetail deer, gray and red fox, coyote or even gobbling wild turkeys. The Killarney Beach Road trailhead is reached at Mile 3.5. The trail departs from the shelter and quickly comes to a junction. Head east (right) and follow the trail as it crosses three bridges, each spanning an old beachline left behind by a retreating Lake Huron centuries ago. In less than a half mile, you come to the paved path at the south end of the lagoon. 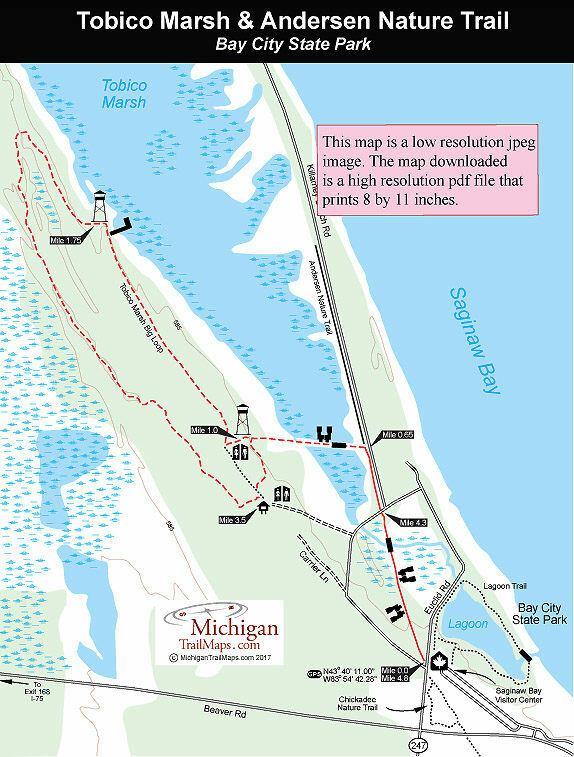 The last leg of the hike is to retrace your steps back along Andersen Nature Trail to return to the Saginaw Bay Visitor Center reached at Mile 4.8. For more opportunities to look for birdlife on the lagoon, continue north on the paved rail-trail and look for sandy paths that head west. Most of them will take you to an open spot to scan the water. Located at the Killarney Beach Road trailhead are vault toilets, a small shelter, and a plaque commemorating Tobico as a registered natural landmark. There are restrooms and drinking water and parking at the Saginaw Bay Visitor Center within the Bay City State Park. The Saginaw Bay Visitor Center (989-667-0717) is open Tuesday through Saturday from 10 a.m. to 5 p.m. and noon to 5 p.m. Sunday. There is a vehicle entry fee to enter Bay City State Park. Bay City State Park is 5 miles north of Bay City and reached from I-75 by departing at exit 168 and heading east on Beaver Road. It's almost 5 miles to the park entrance, just past the intersection with M-247 (Euclid Road). There is also a second trailhead to the Tobico Marsh loop that allows you to skip the visitor center and rail-trail portion. From Beaver Road head north (right) for a half mile on M-247 and then west on Killarney Road to the posted entrance. Contact the Saginaw Bay Visitor Center at (989) 667-0717.